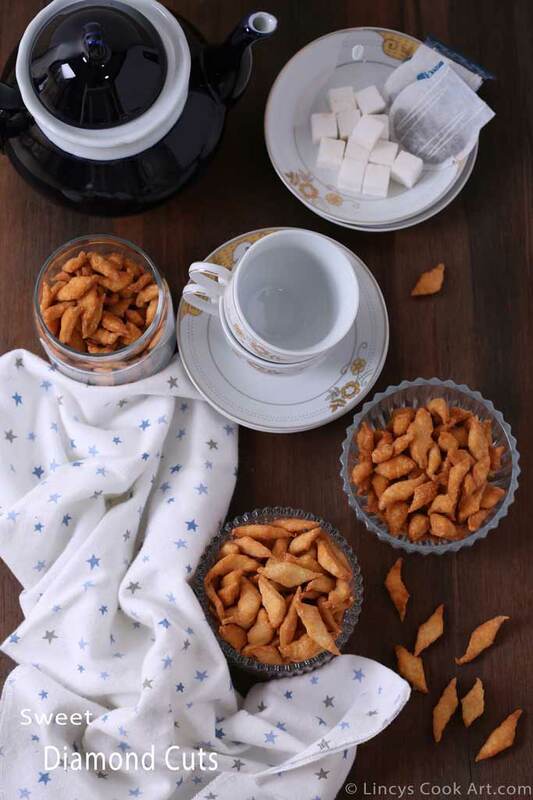 Sweet Diamond cuts| Maida Biscuit| Shankarpali| Shakkar Para is a sweet deep fried biscuit which could be made easily without an oven. It retains the crunchiness for weeks. So therfore could be stored for future use. An awesome instant snack for the hungry school going kids. As a healthy version you could make this in wheat flour too. The same snack in North India called shankarpali or shakkar para, they add more ghee than our south Indian version to obtain a soft texture such that it melts in the mouth as you have it. But both the results are finally the same. *You could add an egg instead of baking soda if desired. Powder the sugar and set aside. In a deep bowl take the maida, add the powdered sugar, baking soda, salt and ghee. Mix with a spoon to combine well. Now add water little by little to combine well with out lumps to make a dough. Transfer the dough on a flat surface and knead to make a smooth dough. Divide the dough in to two equal balls. Dust the surface with flour and using a rolling pin spread the balls in to circular shape. Using a knife or pizza cutter cut them criss- cross to get the diamond shape. Remove each of the cut pieces on to a plate; set aside. Hold the plate carefully to drop the diamond cuts on to the hot oil. Fry them till crisp and deep golden colour. Checkout the spicy version too Savoury diamond cuts.